If there’s one time of year I enjoy above all others, it’s Christmas time. There’s just something about the sights, the sounds, and the smells that make me warm all over. Growing up, one of my favorite things to do each season was to move the little mouse to a new day in our Christmas Countdown Calendar. Nowadays as a mom, I want my kids to have nostalgic Christmas memories just like I do. 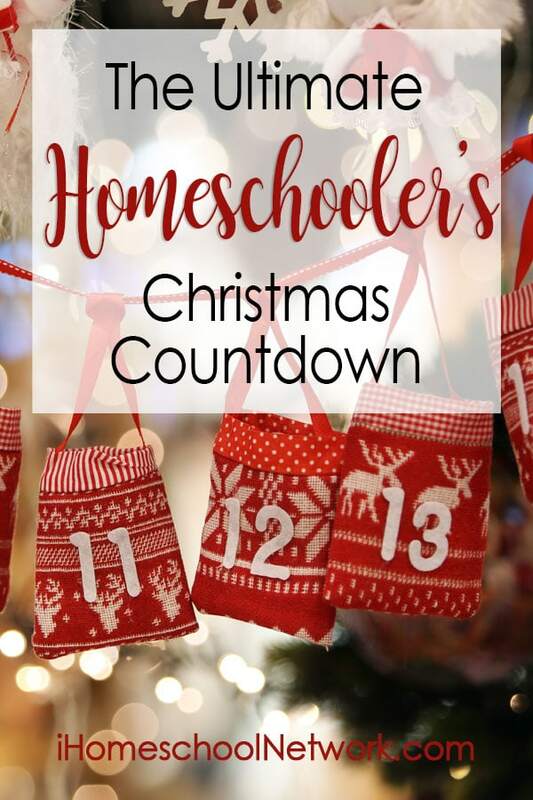 That’s why I came up with our Ultimate Homeschooler’s Christmas Countdown. It’s an inexpensive, original, and educational way for our family to prepare ourselves for the holidays, and it’s something that even my teenagers look forward to every December. Today I’m going to share with you how to get started with this delightful Christmas tradition. Trust me, it’s a keeper! 1. Find yourself a miniature Christmas tree. Whether you decide to use a store-bought Charlie Brown tree or have your children make one out of paper makes no difference. Just find one you love, and put it smack in the middle of your homeschool space. Put some lights on it if you’d like, but don’t add the ornaments just yet! 2. Make a stockpile of 25 simple ornaments. There are so many ways you can do this. We usually use a template to cut book-shaped ornaments out of foam. You could also use plain glass Christmas balls (if you’re that brave! ), construction paper or cardstock, or any other design you can come up with that will leave ample room for your kids to write on them later. Keep them in a basket or other decorative container somewhere near the tree, but don’t hang them up! That comes later. 3. Head to the library and borrow 25 Christmas books. It’s times like this that I really appreciate the fact that we live near a rather large library. There are so many books to choose from! After you bring the books home, have your kids help you wrap them up in Christmas paper. Then, place them under the tree. 4. Starting on December 1st, read one book from under the tree each day. This is when the countdown begins. On December 1st, have one of your kids choose a book from under the tree and let them unwrap it. (If you have more than one child, this is a great way for them to learn to wait their turn!) Choose an ideal time to read it together. Some families may opt to do it first thing in the morning, while others may save it for bedtime. Still others may choose to include it in their homeschool routine. Do what works for you! No matter when you do it, your kids will become more and more excited each day as they see that book pile dwindling. 5. Each day, write the name of the book you read on an ornament. Did you think I forgot about the ornaments? Nope. This is where they come in. Each day after you finish reading your Christmas book together, have one of your children neatly write the name of the book on one of the ornaments they made and then hang it on the tree. As with watching the book pile get smaller, your kids will love to see the ornaments move from the basket to the tree each day. While the tree may look sparse with one ornament on December 1st, that makes seeing it in its glory with 25 ornaments on the 25th all the better! Homeschooling allows families so much time to make beautiful Christmas memories together- memories that are sure to make their way into your children’s traditions when they have kids of their own. Now it’s your turn. Do you have a unique way of counting down the holidays? I'm Shelly, a Christ-following, homeschooling Mom of eleven children and author of my blog, "There's No Place Like Home." When I'm not homeschooling or writing about it, you'll find me at the library balancing stacks of books under my chin. Though my life can be hectic at times... okay, ALL the time, I wouldn't change it for anything.